Kolby Listenbee is looking for a job. ESPN’s Field Yates reports (via Twitter) that the Colts have waived wideout Kolby Listenbee from the IR. The receiver will become a free agent if he goes unclaimed. 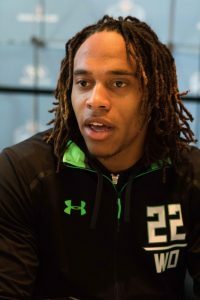 The TCU product was originally projected to be a third- or fourth-round pick in the 2016 draft, but he ended up falling to the Bills in the sixth round. Listenbee was unable to stay healthy during his lone season in Buffalo, and he was released by the team last offseason. He eventually caught on with the Dolphins practice squad before signing with the Colts. He inked a futures deal with Indy back in January, and he was waived/injured last month before ultimately landing on the injured reserve. With Listenbee out of the picture, that means there’s one less receiver competing for one of the final roster spots. Kasen Williams, Deon Cain, Krishawn Hogan, and Seantavius Jones are currently listed at the bottom of the team’s depth chart. Here are Friday’s minor moves. The Bills have added wide receiver Rashad Ross and cut fellow wideout Kolby Listenbee with a waived/non-football injury designation. Buffalo is already the seventh team for Ross, who went undrafted out of Arizona State in 2013. A veteran of 22 regular-season games, Ross has never caught a pass, though he has returned 34 kicks and run one back for a touchdown. Listenbee went to the Bills last year as a sixth-round pick, but the ex-TCU target didn’t participate in any of their games. The Saints have waived linebacker Travis Feeney with an injury designation, tweets Nick Underhill of the Advocate. New Orleans plucked Feeney off the Steelers’ practice squad last December, but the then-rookie sixth-rounder from Washington didn’t see action with either team. The Cardinals have announced three signings – linebacker Alex Bazzie, cornerback Daniel Gray and Chris Hubert – and the waiving of linebacker Mikey Bart. Bazzie is now on his third team dating back May 1, as both the Colts and Panthers cut the ex-Canadian Football League player last month. Gray went undrafted from Utah State and tried out for the Cardinals afterward, but he wasn’t able to earn a roster spot then. He’s a cousin of Cardinals quarterbacks coach Byron Leftwich, notes Brandon Judd of the Deseret News. Hubert has had multiple go-arounds with Arizona since it first signed him undrafted out of Fayetteville State last year. And Bart lasted just over two weeks with the Cardinals, who signed the UDFA from North Carolina on May 17. The Ravens announced that they’ve signed tight end Ryan Malleck and cut cornerback Carlos Davis. Malleck, undrafted from Virginia Tech in 2016, previously spent time with the Giants and Steelers. Davis hooked on with the Ravens last month as an undrafted free agent, but he suffered an injury early in OTAs. The Titans have waived/injured cornerback John Green and signed free agent receiver Mekale McKay. Green had a short stay with the Titans, who signed the undrafted ex-UConn defender in May. McKay, undrafted from Cincinnati a year ago, was previously with the Colts, Jaguars and Broncos. The Broncos have signed guard Christopher Muller, who’s joining his second team since going undrafted last month. Muller, formerly with Rutgers, had a brief stint with the Colts.